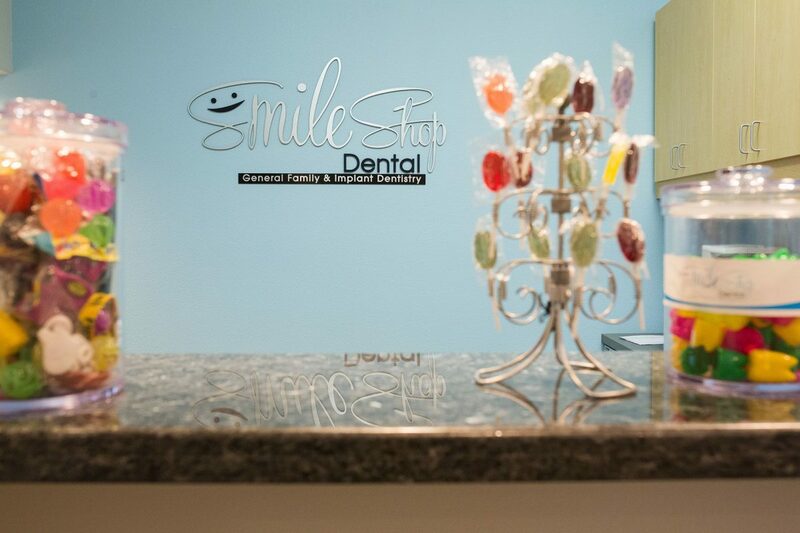 Dental implants are a safe and esthetic alternative to traditional bridges and dentures. 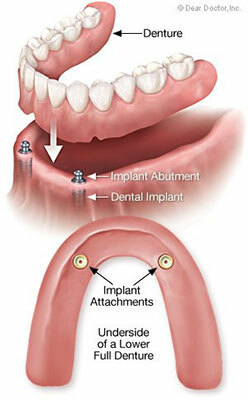 A dental implant is a small “anchor” that replaces what used to be a tooth root. This titanium anchor is inserted into the jawbone and is allowed to heal for some time. Osseointegration is the term used to describe how the bone heals to the implant surface and allows it to be stable. Once this has occurred, a replacement tooth is placed on top of the implant if you are replacing a single tooth. For a range of several missing teeth, more than one implant can be placed to anchor an implant bridge, or to provide more support for an implant retained denture. Implant restorations look and feel more like natural teeth and provide a level of comfort that often is not achieved with traditional dental prostheses. There are many benefits to choosing dental implants as a treatment option. Dental implants help to maintain your bone levels. If you have missing teeth, the bone begins to recede over time. This ultimately will affect your facial structure as the bone changes in size. Dental implants help to prevent this deterioration of the jawbone by maintaining the level of bone that you had existing prior to losing any natural teeth. 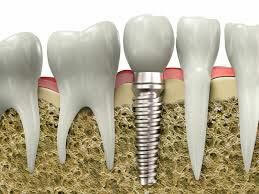 Dental implants also may be a better long-term alternative to bridgework, where adjacent teeth have to be shaved down. Replacing a single tooth that has been lost with an implant allows for the two adjacent teeth to be left alone, whereas in a bridge, the two teeth must be altered. Finally, dental implants can give a level of security because once properly anchored, they do not move around and can better support a denture. This prevents some of the problems of traditional dentures such as sore gums and poor fit. 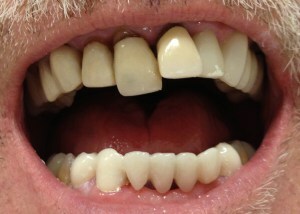 Patient had “buck teeth” and previous lower bridge that was failing. 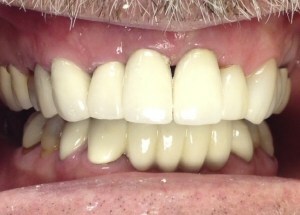 Treated with extracting two upper front teeth and placing implants, and restored bottom arch with new bridge.